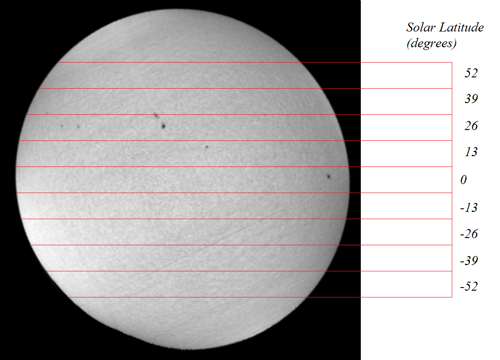 Here are the results of an experiment to measure the differential rotation of the Sun. A result of this differential motion is that the period of solar rotation varies (gets longer) with increasing solar latitude or, in other words, the angular velocity of a point on the photospheric surface decreases with increasing latitude. One technique used to measure this is the observation of sunspot motions over a longer term period as a function of solar latitude. Another technique uses spectroscopy to measure photospheric velocities via the Doppler effect on spectral lines observed at the east (approaching) and west (receding) solar limbs. Here, I'm using a variation of the spectroscopic technique that occurred to me when I noticed a systematic east-west intensity gradient in spectroheliograms measured through a spectral line. 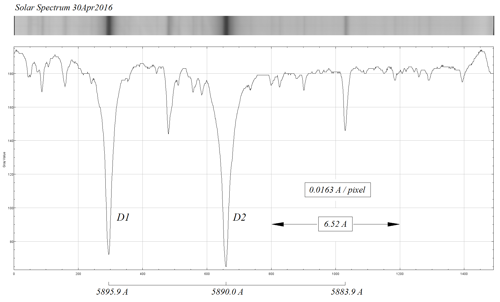 The present work uses spectroheliograms generated around the Na D2 line at 5890 Angstroms. A neat Na D2 line profile is mapped out, fit quite nicely with a Lorentzian lineshape. 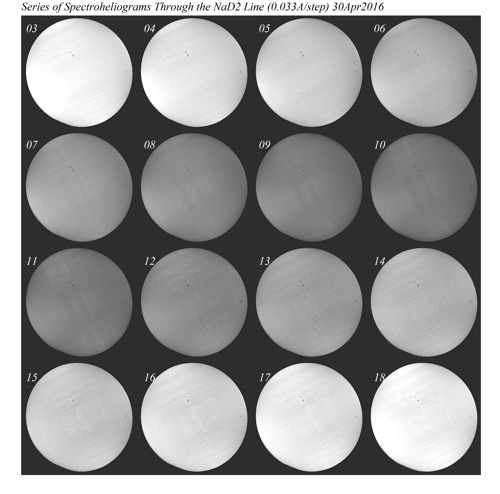 The next figure shows one frame (#06) of the spectral series divided up into latitude zones of 13 degrees width each. 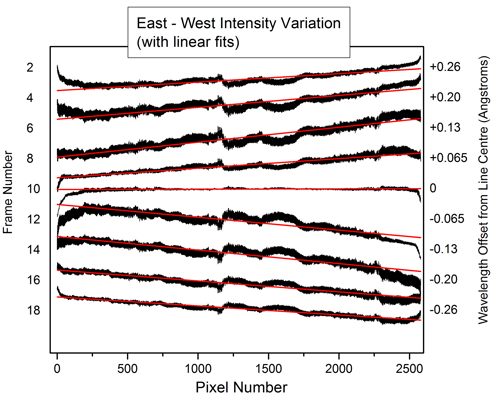 I then averaged over the vertical (latitude) direction in each zone to map out the horizontal (east-west) intensity profiles for each zone and for each frame in the spectral series. 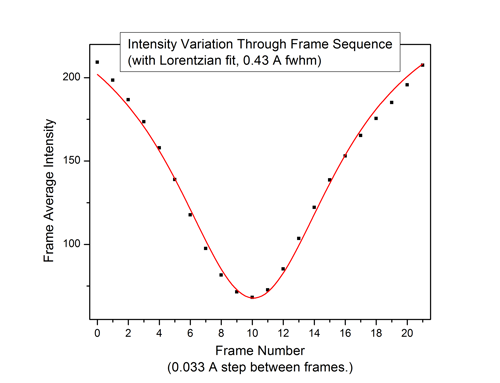 Some example intensity variations are shown in the next figure along with linear fits. The (linear) variation of east-west intensity arises from the Doppler effect on the Na D2 line and allows the determination of the line-of-sight (tangential) velocities at points on the east and west solar limbs using the difference in east-west intensity (determined by the fits). The figure above shows intensity variation curves plotted for the latitude = zero (equatorial) zone for 9 out of the 22 frames in the spectral series. The information in each curve is actually redundant allowing, in this case, 22 determinations of the tangential velocity in the equatorial latitude zone. The redundancy allows lots of averaging to improve the data quality. The extraction of the tangential velocity requires a determination of the associated Doppler shift of the Na line. The general idea (and final formula) is given in the following figure. In the figure above, an absorption line profile is drawn (in black) corresponding to disk centre observation and blue and red Doppler shifted versions of this absorption profile, corresponding to observations at the east and west limbs, are drawn in corresponding colours. The effect on intensity, for a spectroheliogram generated at wavelength lambda_m , can be seen. 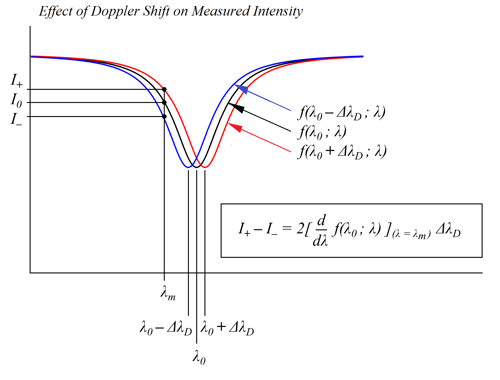 The Doppler shift, delta-lambda_D (between disk centre line profile and a limb), can be determined from the formula. The derivation of this formula is based on a straightforward first order approximation which shows that the east-west intensity difference will be largest where the 1st derivative (local slope) of the line profile is largest (in absolute value). This explains the behaviour of the linear fits in figure 5 above. The line slopes and, correspondingly, the east-west intensity differences are small (in absolute magnitude) in the line wings, increase as line centre is approached and level out to zero at line centre itself. The figure below gives the results. Results (already highly averaged, see above) for latitude zones above the equatorial zone were averaged with results for the corresponding latitude zones below the equator. The figure on the left shows the measured tangential velocities (the quantities directly measured via the Doppler shift) as a function of solar latitude. The curves show the expected variation for a solid rotating sphere (no differential rotation) and for differential rotation from a recently published determination. It's actually surprising (to me!) that the curves for differential rotation and no differential rotation are so close. A better way to visualize the effect of differential rotation is to convert the measured tangential velocities into angular velocities. The result is shown in the figure on the right. In the case of no differential rotation (basically, the rotation of a solid sphere) the angular velocity is constant, independent of latitude. In general, I'm pretty happy with the results. If I look at the (smallest) tangential velocity measured at latitude 52 degrees (1.1 km/s), this corresponds to a spectral resolving power of c/v = 270,000. Not bad for an amateur built, portable, tripod mounted instrument! Edited by Peter Z, 21 April 2017 - 11:57 AM. Edited by robin_astro, 21 April 2017 - 03:36 PM. Thanks for reading the post and for your note. I agree with what you say and I did overstate. I couldn't resist the temptation to phrase it in those terms! Of course, compared to the achievement of Christian Buil's group and their exoplanet work, my measurement of 1.1 km/s vs theirs of 50 m/s is a modest achievement indeed. Thanks for the link. The resolving power of my instrument is 74,000 as determined by a measured average fwhm of 0.085 Angstroms for narrow O2 telluric lines near 6302 Angstroms (https://www.cloudyni...magnetic-field/). Still not bad for an amateur built, portable, tripod mounted instrument. R 74000 is still impressive. I am no expert on spectroheliograpy but had a bit of fun doing simple some crude experiments with my LHIRES III some time back (at Christian Buil's suggestion) but that was only at R 17000.
but your measurements showing the differential rotation rate with latitude are fascinating.